Sri Lanka has fallen prey to Zionist forces of Israel and by way has given leeway for extremist Tamil forces to rise and the Western powers to undermine the war victory, former diplomat Dr. Dayan Jayatilleka has stated at a meeting held in solidarity with the Palestenian people of Gaza. 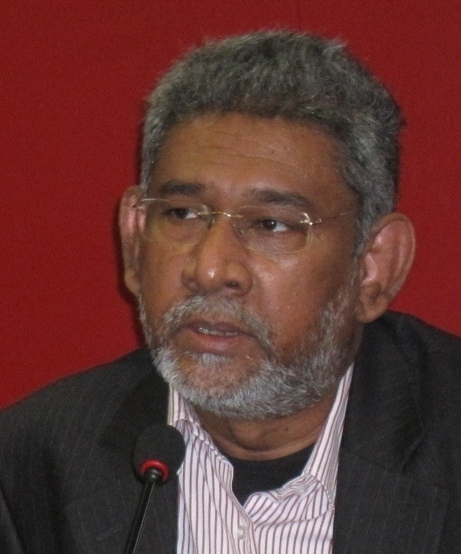 Dr. Jayatilleka addressing the meeting held on Tuesday, had stated that the recent media release issued by the foreign ministry on the Israel- Palestine conflict is exemplary of the Rajapaksa regime’s mistaken stance on the situation in Gaza. “The statement issued by the External Affairs Ministry contains major flaws; it does not mention Palestine or Palestinians, there is no condemnation of the bombings carried out by Israel or of its illegal occupation of Palestine, it does not offer solidarity for an independent Palestine and neither is it mentioned anywhere that the two nations should strive to live peacefully,” Dr. Jayatilleke said pointing out at a recent External Affairs Ministry media statement issued on July 15 – describing it as a reflection of the ‘lack of a policy, empathy, backbone or a brain’ on part of the Sri Lankan government. He said that today Sri Lanka is attempting to follow and imitate Israel and pointed out that is a flawed move quoting a statement made by his father Mervyn De Silva before the Mossad Commission appointed by former President Premadasa in which he had warned that the Sinhala majority should never believe that Israel would side with them because the Zionists have always identified themselves with the LTTE struggle. Dr. Jayatilleka said this fact is further proven by the contents of a book – ‘By way of Deception’ written by one of the youngest spies that worked for Mossad Victor Ostrovsky in which he has revealed that while offering training to the Sri Lankan forces, the actual training was provided by the Mossad to the LTTE. According to Dr. Jayatilleka, a group of top government officials including Government Minister Champika Ranawaka had visited Israel during 2008 – 2009 and had met with the Post Conflict Homeland Security force, whose advice thereafter had been offered to Sri Lanka which the said Sri Lankan officials had accepted. “It was that Israeli model that was implemented in the North following the war. This is the factor that is once again fueling Tamil Eelam extremist forces in the diaspora groups and Tamil Nadu,” he stated. He said it was the stance he took during a debate on the Israeli attack on Gaza in 2008 – 2009 that resulted in him being removed from his position in Geneva, after being questioned by Gotabaya Rajapaksa on his comments at the UNHRC. “Afterwards, the broadest alliance in defense of Sri Lanka’s sovereignty in the UN which I worked hard to build, systematically deteriorated. It was this self-inflicted weakness by Sri Lanka’s own state officials that was exploited by the Tamil Diaspora lobbies, to launch the UN International Inquiry,” he added. Dr. Jayatilleka has gone on to state that although the Sri Lankan army managed to maintain a distinct difference in their operations during the war in comparison to the operatives of the Israeli forces today, the short sighted actions of some government officials has undermined those efforts and instead has played right into the hands of the Western forces that seek to intervene in Sri Lanka. He said it is such policies that are reflected through statements that are made by individuals such as BBS General Secretary Galagoda Atte Gnanasara when he says that if Rauff Hakeem turns Maligawatte into a Gaza they are ready to turn into an Israel. “What is he implying through such a statement? That they would bomb Maligawatte and kill innocent women and children?,” he questioned. – the surge of anti-Muslim elements in the country.